What are U.S. workers missing? What many U.S. workers may not know is that every other developed country has a legal requirement for paid vacation and holidays. Visiting other counties can mean drinking coffee in cafes, museums, night life and relaxing next to the sea. The best trips also include conversations with people from these lands. I just taught a class in Romania and then visited Scandinavia to see friends and relatives. In both places I talked about work and family life. The first issue that always comes up is paid vacation, which America does not require. What many U.S. workers may not know is that every other developed country has a legal requirement for paid vacation and holidays. All countries in the European Union require at least four weeks of paid vacation. Austria is the most generous, guaranteeing workers a legal minimum of 22 paid vacation days and 13 paid holidays each year. U.S. workers have to depend on competition for such benefits. Companies must compete for workers. So in the U.S. the average worker gets 16 paid vacation days and holidays. However, that average is brought down by the fact that 1 in 4 U.S. workers does not have a single paid day off. That would not be allowed in Europe, or New Zealand, or Japan or Canada. In Canada, the federal government requires 19 paid days, and some provinces add additional time. This data, from the Center for Economic and Policy Research (CEPR) and USA Today, reflects what I heard in conversations during the last few weeks. I can hear it now: Raising benefits will cost jobs. Wrong. The CEPR data comes from 2012 when Germany with one of the most generous time-off packages had an unemployment rate of just 5.5 percent when ours was 8.1. It becomes part of the overall marketplace. Maternity leave is another benefit where the U.S. falls behind. According to the International Labour Organization and a study at McGill University in Canada, the U.S. joins Papua New Guinea, Swaziland, Liberia and Lesotho as countries that provide no financial support for working mothers through their job. Since Bill Clinton pushed through the FMLA (the Family and Medical Leave Act), a mother in the U.S. can take off 12 weeks to give birth but there is no requirement that the time off be paid. Again when I talked to people on my recent trip, I was amazed that a worker in Sweden can get 420 days to take care of a new baby with 80 percent pay. That can be shared between the mother and father. Most other countries are not so generous but Germany gives 14 weeks and Denmark requires a full year at 100 percent of pay. Japan demands 14 weeks at 67 percent of pay. In New Zealand, 14 weeks are paid at 100 percent and one can ask for another 38 weeks unpaid. Canada requires 52 weeks, with 17 weeks paid. These are countries with successful economies. In some, jobs are harder to get than in the U.S. but in others, like Germany and New Zealand, the unemployment rate is lower than ours. Travel overseas is a good thing. You get to relax, recharge the batteries and come back ready to do your job better. You also might learn that what we have come to accept as reasonable family and work life in this country is so out-of-step with the rest of the world. Author iowapolicypointsPosted on June 23, 2014 Categories Economic Opportunity, OrganizationTags Center for Economic and Policy Research, David Osterberg, family leave, Iowa Policy Project, paid family leave, paid vacationsLeave a comment on What are U.S. workers missing? When we start talking about raising the minimum wage in Iowa the most important point is that we’ve been at $7.25 since Jan. 1, 2008, more than a year before the federal minimum rose. And every year that goes by without an increase affects Iowa families who are struggling to keep their heads above water. Families that count on minimum wage income for a major share of their household budget have seen their costs rise dramatically over the past six years. In both Iowa and in Congress, there are proposals to raise the minimum wage to $10.10. In both Iowa and in Congress, many issues are raised to cloud what is really a pretty straightforward issue. 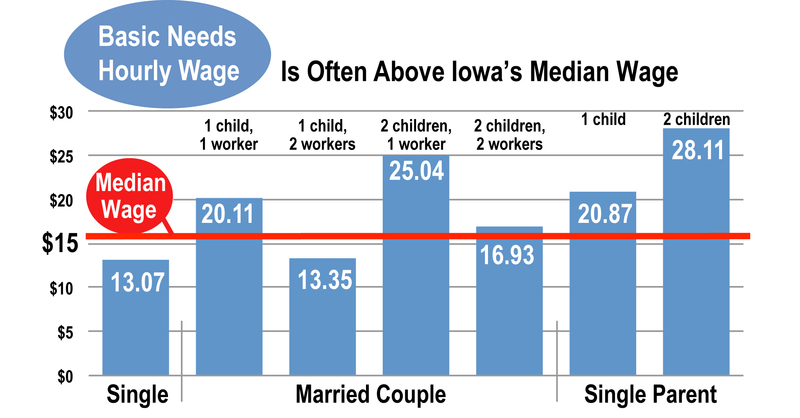 As we have shown in our most recent Cost of Living in Iowa report, the current minimum wage doesn’t even come close to paying the bills. A single parent with two children working a full-time job would need to make $28.11 per hour just to be able to pay for a basic, no-frills monthly budget; $56,212 annually before taxes and credits. Two-parent families with two children would each need to make $16.93 an hour or a combined total of $67,724 a year before taxes and credits. A single parent with two children working full time making $7.25 per hour is making $4,700 below what the federal government deems poverty for a family of this size and nearly four times less than what is needed for a family supporting hourly wage. Thirteen states have already seen an increase this year and now 21 states and the District of Columbia have a higher minimum wage than the federal. As these states have shown, there is no reason to wait for Congress because it’s not guaranteed that they are going to act in the near future. One of the myths we hear is that increasing the minimum wage would lead to serious job losses — but the weight of the evidence shows that the net employment effect is minimal and that any slight loss of jobs is compensated by the increase in income for those low-wage families. Low-wage workers who see a wage increase are more likely to spend that additional income immediately, which puts more demand on goods and services and more money in the hands of small-businesses owners who may need to hire more people to keep up with that demand. A prominent study last year by the Center for Economic and Policy Research explains why this employment effect is so small. Employers can adapt to wage increases through various channels. Employers might reduce the number of hours worked, for example, but the higher pay can raise the standard of living for affected employees. Higher pay can make it easier to find and keep employees; less employee turnover reduces training costs. There could be reductions in non-wage benefits, improvements in efficiency, higher demand from increased consumer spending, and employers may start upgrading the skill level of their workforce rather than cutting the level of their staffing. Employers might pass on some added costs as higher prices to consumers, but this increase is estimated to be very small. On one point there can be no dispute: A higher minimum wage will substantially lift the earnings of low-wage workers and families will be better off. Now at six years, how long will the minimum wage be held down for families facing higher and higher costs? Why is job outlook dim? Don’t blame an educational gap or the business cycle. Long-term projections favor low-wage service jobs over better-paying sectors. The chart projecting Iowa jobs in the near future is not pretty. Using the most current state level numbers, for 2008-2018), this graph shows that the fastest growing jobs taking larger shares of the Iowa job market through 2018 are in sectors that pay lower than the state median wage. Dots represent occupations; blue dots pay higher than the statewide median wage (2011 numbers) and red dots pay lower. Move your cursor to each dot to see the occupation, its 2008 employment, its median wage and projected employment. Only 4 of 18 occupations projecting job gains over 1,500 by 2018 pay better than a median wage, and only one of the 10 occupations projecting job gains over 2,000 pay better than the median. Six occupations (retail sales, office clerk, nursing aides, home health aides, food preparation, and customer service) project job growth greater than 4,000 and the highest wage in this group falls more than $2.00 short of the median wage. Why is this happening? Don’t blame it on an educational gap, in which workers with skills pull away from the rest. As the Center for Economic and Policy Research has shown — here and here and here — today’s low wage workers are older and better educated than ever. It also is not an artifact of the business cycle, as the Department of Labor estimates in long-term projections that about a third of new jobs through the next decade will be in low-wage service occupations (retail, home health care, child care, janitorial). Combine these projections with the troubling trend of the last business cycle, which hit good jobs hard. The National Employment Law Project has shown (here and updated here), that job losses during the recession were concentrated in mid-wage occupations, while job gains during the recovery have been concentrated at the low end. Our work, it seems, is cut out for us — well-paid or not.